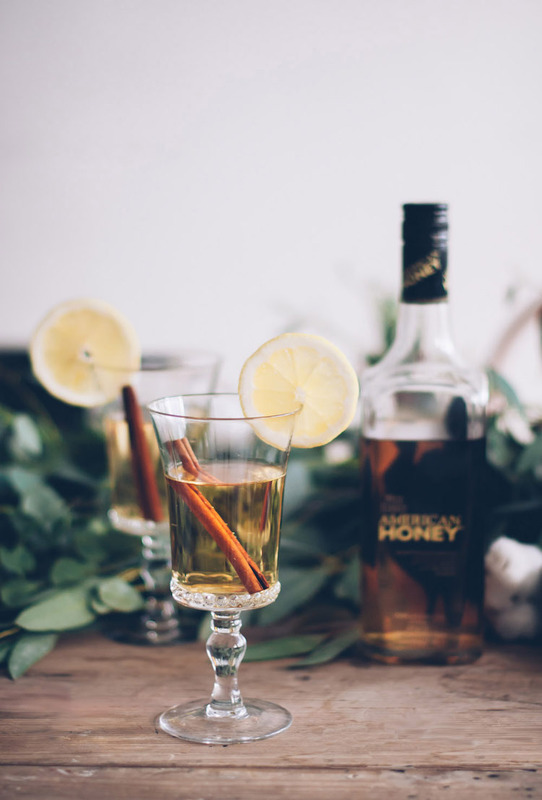 I recently threw a Friendsgiving with American Honey to kick of the off the holiday season! I invited a few friends over to enjoy a home cooked Thanksgiving meal that included a honey whiskey glazed turkey and lots of cocktails to sip on while they feasted! I love Friendsgiving because it brings friends closer together over two of my favorite things: drinks and food! These two things can create amazing bonds among people; memorable stories around food are tightly woven through all of us. 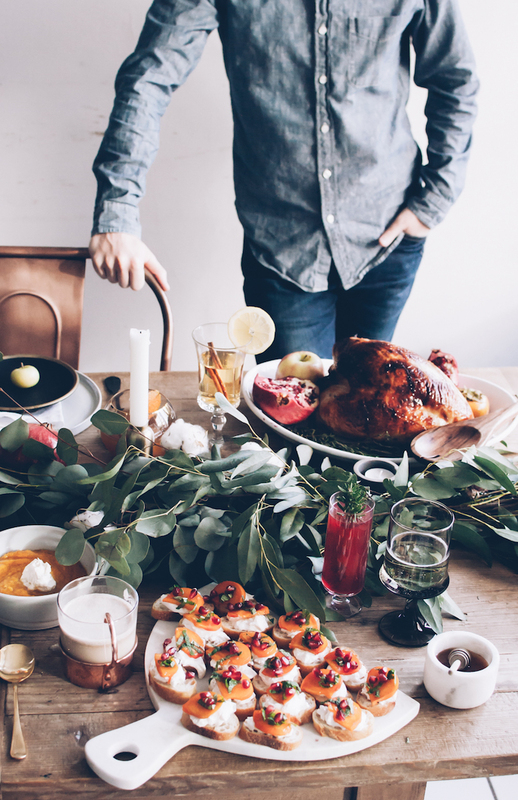 People have so many connections and fond memories with the food severed round the table on Thanksgiving. My mom’s stuffing recipe that was passed down from her grand mom instantly brings back all those years at my grandmothers house with all my aunts uncles, cousins, great aunts sibblings, friends of the family… and you never knew who would stop by for dessert! I even remember the time I thought I was sooo cool because they gave me a cordial glass of champagne to toast with everyone when I was 12 (ha!). Now a days living on the west coast 1000 of miles from the closest family, is not always easy to make it home for Thanksgiving. Its nice to be able to gather with friends to share a meal together to celebrate and give thanks. 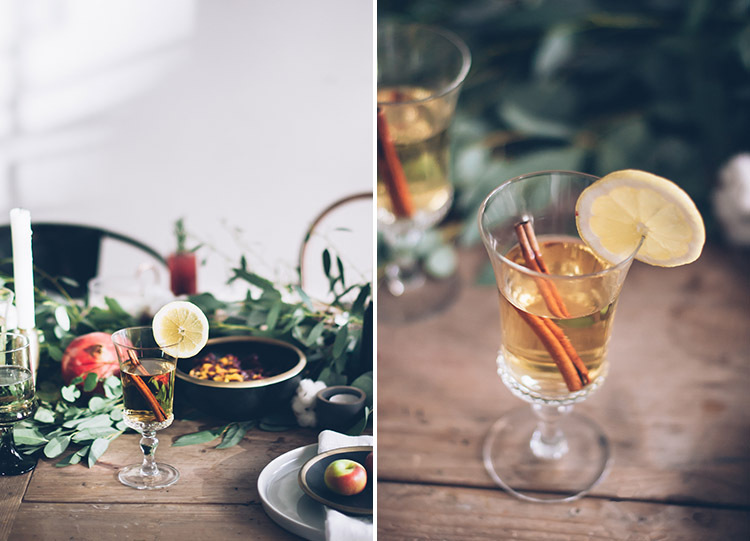 Today I am sharing one of my favorite cold weather tipples that I served at my Friendsgiving: Hot Toddies! A relatively simple drink, these are like hot liquid gold! 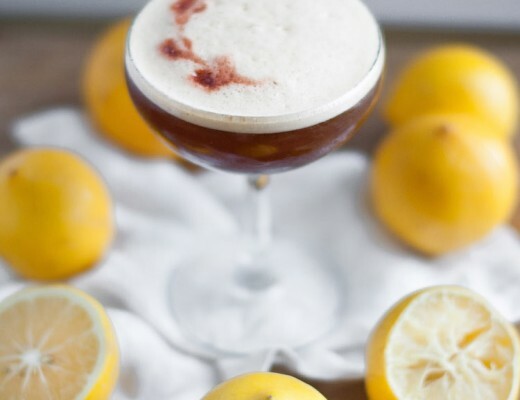 Throw in some whiskey, honey and spices in a glass and add some hot water and you have yourself a drink that will warm you from the inside out. I don’t know about you, but that’s just the thing I need in this increasingly cold weather! Brrr! 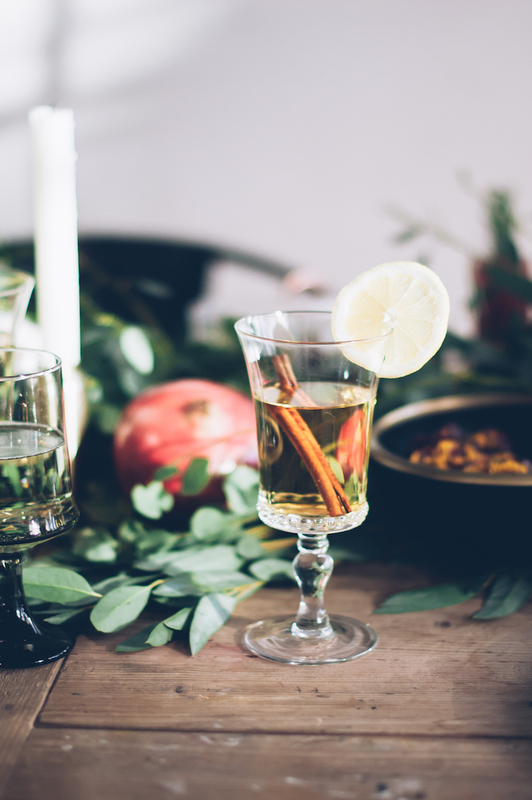 Not only are Hot Toddies fine to guzzle while sick, they are encouraged! As I write this, I sadly have a sore throat (at the most inconvenient time too) so I’ll be enjoying these for the next few days rather than my usual night cap. 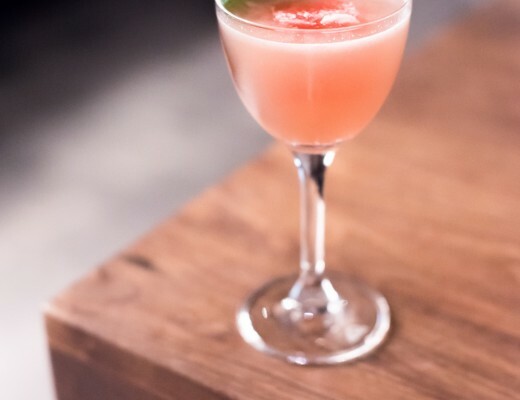 There’s something about this drink that really makes colds more bearable. It’s served up piping hot, the delicious honey soothes and then the whiskey just seems to chase away what ever is ailing you. Cold, be gone! 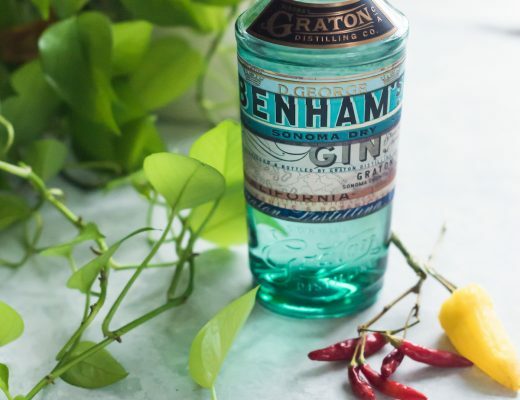 This recipe requires some infusing of whiskey, so start a batch now and you’ll have delicious spiced booze for a Hot Toddy and other drinks in 2 weeks! 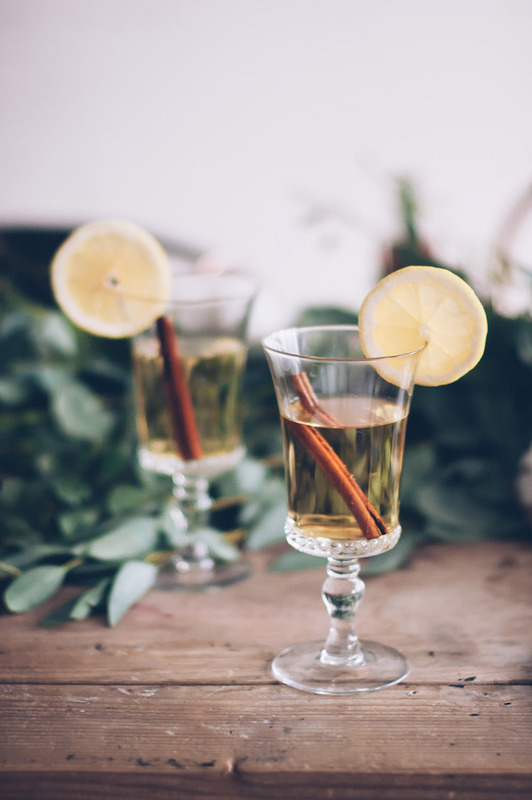 If you are just tuning in now looking for a Hot Toddy recipe to whip up right this second, simmer down, I have you covered! Simply omit the infusion step and add fresh whole cloves to a lemon peel and place this into the glass rather then the lemon slice garnish. Add in the cinnamon stick as well before pouring the hot water to help infuse their spicy goodness into the cocktail. I used American Honey here which is a smooth, sweet honey infused bourbon from Wild Turkey. But if you do not have this laying on your bar, any bourbon or whiskey will do. Add hot water to a stemmed glass or mug to heat up the cup for a few minutes. Dup the water. Add honey, American Honey, and cinnamon stick to the glass. Twist lemon peel over glass and discard. Top with the 1/3 cup of hot water. I will be sharing everything I made leading up to Thanksgiving so keep checking back for all of the recipes!